Most everyone recognizes the above song lyrics, “My Favorite Things,” from The Sound of Music. It’s a story that’s been told for years and years, on stage and television. I especially love watching it with my family throughout the holidays. During a PRSSA mixer I was at last week, we were talking about Twitter chats…it got me thinking about the little things I love about public relations and tying it back to the theme of that song. So here you have it – My Favorite [PR] Things! For public relations, Twitter chats aren’t seen as an opportunity to gain followers, but rather an intense, real networking opportunity. With a wide range of topics; hosted by influencers, bloggers and companies; occurring daily, weekly, monthly; you can learn and engage with others. I’ve always continued to enjoy the tweets of anyone I followed during a chat and have even met some of my “virtual” friends at conferences. Anyone in public relations knows how engrained AP style is in their brain. Using it daily means it’s something that will easily catch your eye if something is written incorrectly. 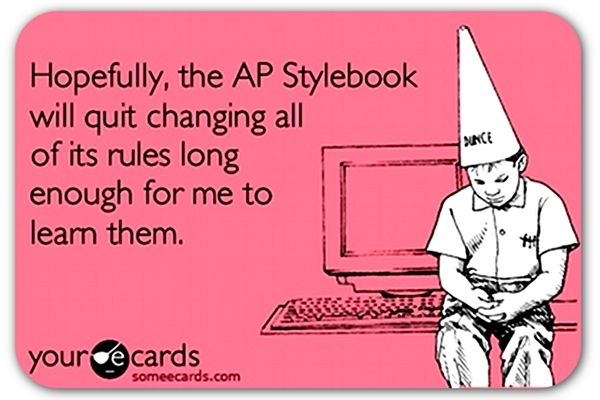 With everything becoming digital the AP Stylebook is also conveniently available for tablets. There has been numerous nights out at dinner with my PR friends when we have debated a style rule or questioned spelling – all with smiles and laughter. Free stuff!? – my roommates ask. Of course! For anyone active on almost all mainstream social media platforms (you should be if you’re building a personal brand and demonstrating skills during a job search) it’s crucial to have Klout. Measuring your online influence, you’ll be able to benchmark yourself against other similar professionals and track changes in your engagement. By becoming a key influencer you will start to receive perks. If significant amounts of people are following and engaging with your networks, companies will offer you samples of new products to test and review. It’s an easy and awesome way to get your name out. What are your favorite parts about public relations – as a student or professional?